Scientists for the first time have directly detected key organic compounds in a comet, bolstering the notion that these celestial objects delivered such chemical building blocks for life long ago to Earth and throughout the solar system. The European Space Agency’s Rosetta spacecraft made several detections of the amino acid glycine, used by living organisms to make proteins, in the cloud of gas and dust surrounding Comet 67P/Churyumov-Gerasimenko, scientists said on Friday. Glycine previously was indirectly detected in samples returned to Earth in 2006 from another comet, Wild 2. But there were contamination issues with the samples, which landed in the Utah desert, that complicated the scientific analysis. “Having found glycine in more than one comet shows that neither Wild 2 nor 67P are exceptions,” saidRosetta scientist Kathrin Altwegg of the University of Bern in Switzerland, who led the research published in the journal Science Advances. The discovery implies that glycine is a common ingredient in regions of the universe where stars and planets have formed, Altwegg said. “Amino acids are everywhere, and life could possibly also start in many places in the universe,” Altwegg added. Altwegg and colleagues also found phosphorus, a key elementin all living organisms, and other organic molecules in dustsurrounding comet 67P. It was the first time phosphorus was found around a comet. Scientists have long debated the circumstances around theorigin of life on Earth billions of years ago, including thehypothesis that comets and asteroids carrying organicmolecules crashed into the oceans on the Earth early in itshistory.”Meteorites and now comets prove that Earth has been seeded with many critical biomolecules over its entire history,” said University of Washington astronomer Donald Brownlee, who led Nasa’s Stardust comet sample return mission.Scientists plan to use Rosetta to look for other complex organic compounds around the same comet. “You need more than amino acids to form a living cell,” Altwegg said. “It’s the multitude of molecules which make up the ingredients for life.” Rosetta is due to end its two-year mission at 67P by flying very close to the comet and then crash-land onto its surface this September. 67P is in an elliptical orbit that loops around the sun between the orbits of the planets Jupiter and Earth. The comet is heading back out toward Jupiter after reaching its closest approach to the sun last August. 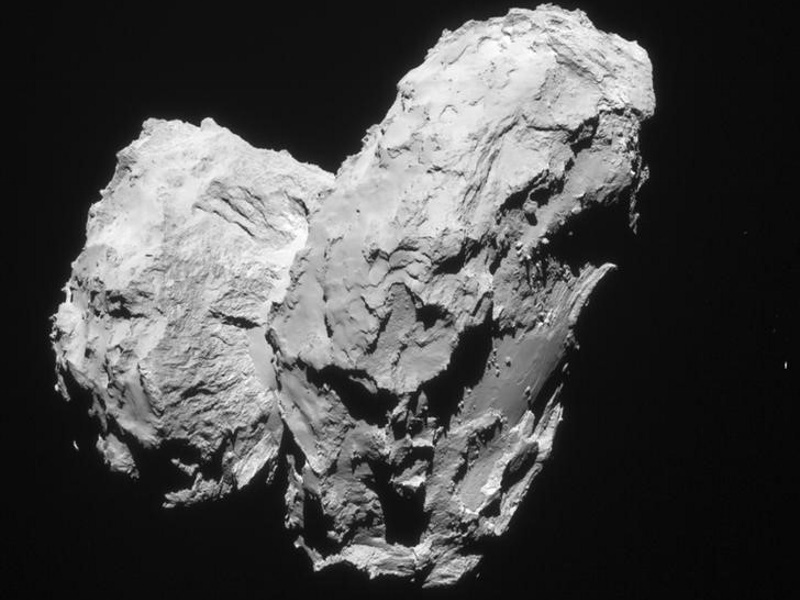 No Comments on "Rosetta Spacecraft Finds Key Building Blocks for Life in a Comet"